The June Employment Report is in. Once again, I think it is from another planet. Nonfarm payroll employment increased by 132,000 in June, and the unemployment rate was unchanged at 4.5 percent, the Bureau of Labor Statistics of the U.S. Department of Labor reported today. Employment rose in several service-providing industries, while manufacturing employment continued to decline. Average hourly earnings rose by 6 cents, or 0.3 percent, over the month. The number of unemployed persons (6.9 million) was essentially unchanged in June, and the unemployment rate held at 4.5 percent. The jobless rate has ranged from 4.4 to 4.6 percent since September 2006. Health care was once again a bright spot with employment growing by 30,000. Employment in social assistance was up by 13,000 over the month. Social assistance has added 84,000 jobs in the last 12 months. Those jobs are mostly low paying jobs. Food services and drinking places added 35,000 jobs in June. Again, those are low paying jobs. Manufacturing employment continued to trend down in June -18,000. Those tend to be better paying jobs. Government jobs rose a shocking 40,000. Over the year, state and local governments together added 347,000 jobs, while federal employment was about unchanged. Wow. 40,000 new government jobs were created in June alone, with 347,000 over the course of the year (and all at the state and local level). A mere 92,000 private sector jobs were created in June. This is a strong economy? But stop and think about this for a second. Think about falling property values and stagnating property taxes as a result. Think states are going to be able to stay on this insane hiring binge? I don't, certainly not without raising taxes. If anything, I expect to see reductions in services especially in places like Florida where property taxes were just slashed. The next question is whether or not we really created 92,000 private sector jobs. I doubt it. The overall number seems plausible until you look at how we got there. Closer inspection shows this is the fourth consecutive jobs report that appears like it was written about Pluto or Mars. Once again The birth/death model numbers are other worldly. Look at all the subprime lenders that blew up. Look at the problems in housing itself. Next take a look at the number of jobs the BLS assumes to have been created in construction. The BLS is assuming not only that jobs were added, but that new unaccounted construction businesses were created in this environment (where business capex spending has been weak, housing has been horrid, over 60 lenders have gone out of business or stopped writing loans, and the GDP has collapsed from 3.5% to .6%). Last month I spoke with economist Paul Kasriel at the Northern Trust about this very issue. Neither he nor I find those revisions reasonable. The reason is simple. The idea behind the birth/death model is the birth and death of businesses (supposedly in relation to the business cycle). Are new construction companies really being created in this environment or are they going out of business? If the latter, perhaps jobs should have been subtracted (not added) to construction businesses numbers. With 142,000 construction jobs being added over the last four months by the BLS model, these reports look like they are from some other planet. Even the leisure and hospitality adjustments (low paying jobs) do not look reasonable, but if there is any growth in jobs at all it most assuredly is on the low end. A note of caution: One cannot take the birth death adjustments and subtract them from the reported numbers because one set of numbers is seasonally adjusted, the other is not. Nonetheless, without these upward revisions, this month at 156,000 total jobs assumed, the jobs picture is weaker (much weaker) than these numbers indicate. The birth/death model at the BLS stopped working long ago (assuming it ever was working in the first place). Asha Bangalore writing for the Northern Trust is reporting Jobless Claims Indicate Slow Hiring. Initial jobless claims increased 2,000 to 318,000 during the week ended July 1. The 4-week moving average is 318,500, up from 304,250 in the last week of May. 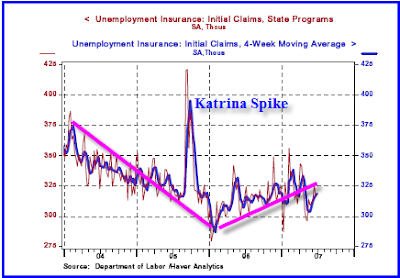 Continuing claims, which lag initial claims rose 84,000 to 2.569 million and the insured unemployment rate was 2.0%, after nine straight weekly readings of 1.9%. Seasonally unadjusted initial jobless claims were 2.1% from a year ago after posting four weekly readings that were positive. The main message is that robust hiring conditions are not in place. Chart courtesy of The Northern Trust annotated by Mish. Barrington Illinois is a very affluent Chicago suburb not more than 20 minutes from where I live. I was wondering when suburbs like Barrington would get hit. It has now happened. The Chicago Tribune is reporting Layoff fears part of 'new normal'. Good skills and a good attitude no longer ensure steady employment, even when the economy is humming. The center of greater Barrington, population 40,000, is a compact village reminiscent of a Norman Rockwell painting. Radiating in all directions are six affiliated communities offering winding roads with 5-acre lots and gated enclaves. Nearby corporate headquarters include Motorola Inc. in Schaumburg, Sears Holdings Corp. in Hoffman Estates, Allstate Corp. in Northbrook, and Baxter International Inc. and Walgreen Co., both in Deerfield. Eighty-six percent of greater Barrington's employed adults work as managers and professionals, or in sales and office jobs. The median household income tops $110,000. But below the surface of a strong economy is an unsettling trend that may be contributing to worrying changes in the school lunch program and elsewhere. Residents seem to be losing jobs at a faster clip. They land back on their feet but not necessarily at the kind of salaries to which they had become accustomed. "There's more recycling going on, faster cycling," said retired consultant Philip Roussel, who sits on the board of the Barrington Career Center, which helps job seekers in the northwest suburbs. Despite low unemployment, attendance at a weekly networking meeting is up 37 percent. People find jobs faster in a good economy "but more people are losing jobs than you might think," Roussel says. When Barrington residents were asked in 1996 to check which of 10 difficulties their household faced, "difficulty finding child care" got the biggest score. It was the first survey by a coalition of 20 non-profit and government groups. By 2005, "involuntary job loss due to downsizing or other reason" topped the list, followed closely by "difficulty paying bills" and "put off health care" because of cost or lack of insurance. By comparison, child care had become a minor issue. The 2005 survey, the latest one, came as a shock because 16 percent of residents who responded said someone in their household had lost a job within the previous 12 months -- more than eight times the 1996 rate. Deborah Villers sensed something was different several years ago when it came time to get ready for annual "Giving Day" in mid-December. Organizers invite needy families to a school gymnasium filled with donated toys, clothes and food. Villers' job at Barrington Community Unit School District 220 was to prepare a mailing list of households that received free or subsidized school lunches. But unlike years past, the schools' allotment of 300 invitations wasn't enough to cover all the families. Unnerved, she pared the list to free lunch recipients, but there were still 50 too many. Familiar addresses leaped out at her. They were from affluent neighborhoods, not just lower-income communities on Barrington's fringes. Activity is brisk at the non-profit Barrington Career Center, which served 600 people from 100 communities last year. "The information that comes out from the Department of Labor makes it look like it's a really rosy picture, but that's not what we see at all," says Monica Keane, the center's director. Linda Spinelli, out of work since her position as vice president of purchasing for a local home builder was eliminated in February, visited the center for the first time this spring. She scanned the sign-in sheet, her eyes jumping down the titles -- general manager, director, senior analyst -- and former employers -- Motorola, Bank of America, R.R. Donnelley, Allstate. "Whoa, these are heavy hitters, people in the same position I'm in," the Barrington resident recalls thinking. Maybe there are lots of high end jobs in Silicon Valley or in Washington near Microsoft but as a general rule I sure doubt it. When school lunches become a concern in places like Barrington, I am quite sure there is a problem. For months now people have been telling me that there are lots of jobs on the high end. I did not believe it then and I sure do not believe it now.